Skybright is plunged into the terrifying Underworld where demons are bred, while Stone, stripped of his immortal status, must find a way to close hell's breach before more mortals die. Meanwhile, Zhen Ni, Skybright's former mistress and friend, is now wed to the strange and brutish Master Bei, and she finds herself trapped inside an opulent but empty manor. 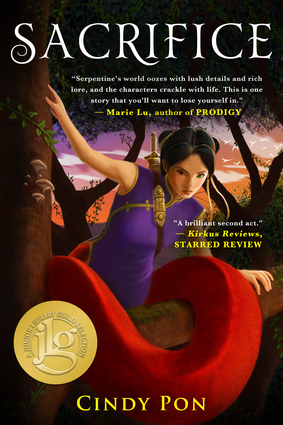 When she discovers half-eaten corpses beneath the estate, Zhen Ni worries that Master Bei is not all he seems. As Skybright begins the dangerous work of freeing Zhen Ni with the aid of Kai Sen and Stone, nothing can prepare them for an encounter so dark that it threatens to overtake their very beings. Cindy Pon is a writer and a longtime student of Chinese brush painting. She is the author of Fury and the Phoenix, Serpentine, and Silver Phoenix, which was named one of Booklist's Top Ten Fantasy and Science Fiction Books for Youth, and one of 2009's best Fantasy, Science Fiction and Horror by VOYA. She lives in Southern California.